Mark your calendars! Friday, August 24, 2018 at the NV Trout Ponds, Summerfest Fireworks!! Please help us spread the word! Invite your friends, your family, your neighbors, your co-workers, anyone that enjoys a good time! 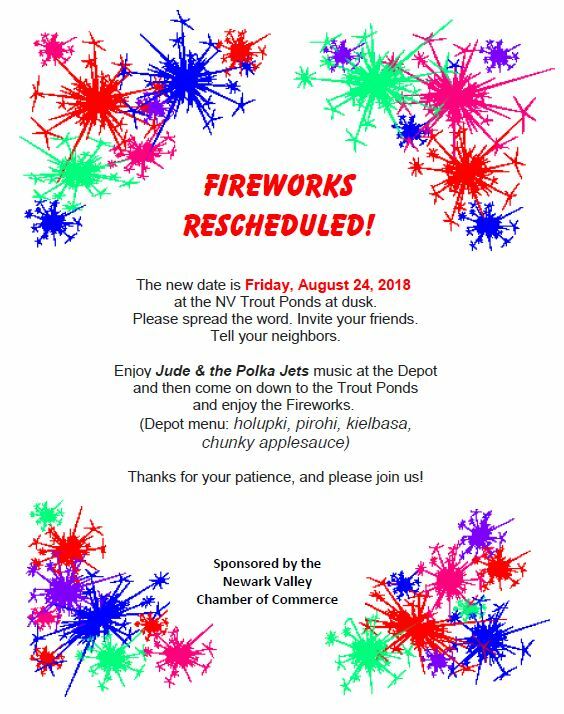 Head over to the NV Depot to enjoy music by Jude & the Polka Jets from 7-9pm and then come on down to the Trout Ponds and enjoy the Fireworks! Welcome to the Village of Newark Valley! We hope you find what you are searching for in this electronic view of our rural unique Village. Our one thousand fifty residents offer a sincere welcome to our friends and to those who are not familiar with the areas' rolling hills, vistas and other scenic attributes of New York's Southern Tier. We are creating these digital pages of information so our citizens may seek information such as, Village Codes, Municipal Meeting days/dates and time; ask questions of your Municipal leaders and Staff via the e-mail format or just tell us "What is on your mind". Information must be easy to retrieve and we believe this user friendly format will be useful to everyone. Our five members Board of Trustees welcome your insight and participation with the opportunities and obstacles in operating this community in the most fiscally responsible manner. We wish to improve infrastructure, tax base and attractions in our Village. With your comments and help - that will happen.